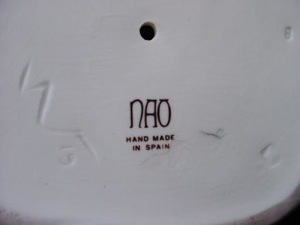 It is known that some of the Zaphir models can be found with later NAO marks because, when Lladró closed the Zaphir brand around 1982 or so, any Zaphir models then in production were brought over into the NAO brand. (Many of these were, in fairly short order, also retired from NAO production as well.) I do not consider these items "clones" in the sense I have used that term to describe NAO clones because, in the Zaphir to NAO evolution, we are talking about a natural phase-out of one brand into another. In discussing "clones," then, I am talking about a more episodic "twinning" phenomenon in which a few items made in NAO or Zaphir have also been found with old, impressed core collection marks. 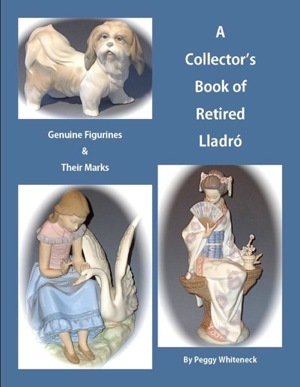 For some time, veteran collectors have also been familiar with the phenomenon of NAO-marked clones of older Lladró pieces, including some of the core collection pieces catalogued as rare in company sources (items usually numbered with a decimal point). I scanned this picture of Zaphir's "Elf" #601 from a 1978 Zaphir retail catalog. Having seen this item in the Zaphir catalog of this web site, a collector recently contacted me to say that he has a nearly identical item marked with an old, impressed Lladró mark. (Under the circumstances described here, I'm not at all surprised!) The only difference, he says, is that his Lladró-marked item has a quiver of arrows tucked into that space between the figure's body and the branch of the tree stump. 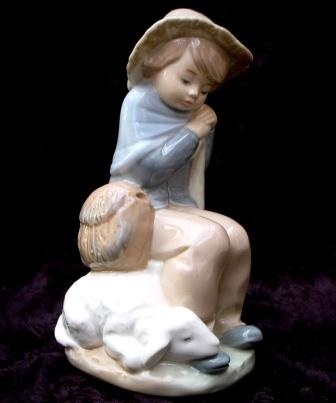 Once again, sculptor Fulgencio García appears to have been the link in this mystery of models shared among the three brands. As is the case with all the NAO clones of core collection items, García was the core collection sculptor of record for all the Lladró models that have been found with Zaphir marks (see table below). 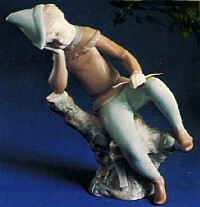 Thus, even though a 1978 catalog for Zaphir identifies Jose Puche (also a famous sculptor of the core collection) as "the" sculptor for the Zaphir collection, it now appears that at least a few of the Zaphir models were sculpted by García and others. Stranger still, a few Zaphir-marked items of core collection pieces have also been found - again, including at least two of the decimal-point numbered rarities. Recently, also, I was contacted by Gill Billington of the United Kingdom, who sent me photos of the model and base of what is the first example I've come across of a Zaphir model with an older NAO mark (the original brown backstamp), an item that does not appear otherwise to have been catalogued in the NAO line. What makes all this especially intriguing is that there is no evidence that Zaphir is as old as either the NAO collection or the regular Lladró collection. 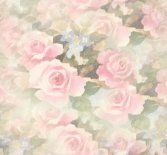 As far as I've been able to determine, Zaphir was not on the scene much before the late 1970s, giving the other two collections a good ten years or more of a head start on its production. How, then, Zaphir would have been recycling older Lladró and NAO models is something of a puzzle. Whenever I come across another of these odd connections, I find myself wishing I'd been a fly on the wall to know how this all got started - and how it eventually sorted itself out into three different brands! Notes: Zaphir #731, Satyr Group, is listed in the Zaphir price list for 1981 and is presumed to be the same model as Lladró #1008 based on the pattern established by the individual satyr models. It is also fascinating to know that the "Athena" and "Aristotle" models are the only items known to have been made under all three brand marks, as these were also made as NAO!